So? I see NOTHING in that study that is a problem. If these organizations involved were leftist organizations you would celebrate it. Thank goodness there are other organizations to combat the idiocy from the left. You demonstrate that idiocy and hypocrisy well. A new wave of school voucher bills is sweeping the nation, which would allow public education funds to be used in private or parochial schools. 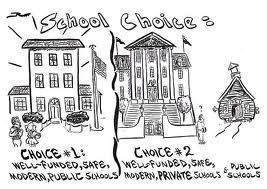 As with past waves of voucher initiatives, these new bills are largely promoted and funded by the billionaire DeVos family and a core group of wealthy pro-privatization supporters. They include Pennsylvania SB-1, soon coming to a vote in the PA Senate, and the "Vouchers-for-All" bill approved by the Florida Senate Education Committee on April 14. Betsy DeVos is at the helm of organizations that have set the stage for both bills, but you would never know it based on the propaganda being marketed to Pennsylvanians. Even if you are from another state, keep reading. Chances are a Betsy DeVos-led campaign is already at work in your state or will be there soon.